Sometimes Melbourne surprises you with its restaurants, and you can find real gems in many places around town. Som Tam is a Thai restaurant located in Thornbury, and is one of the latest Thai restaurants to hit Melbourne. 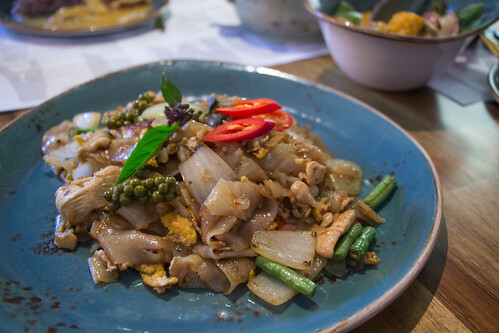 Having opened earlier this year, Som Tam serves authentic Thai cuisine and what’s appealing about Som Tam is that the dishes on the menu are meant for sharing and in many ways this is a great thing, especially so as you can taste a wider range of dishes on offer. You can check out their menu here. 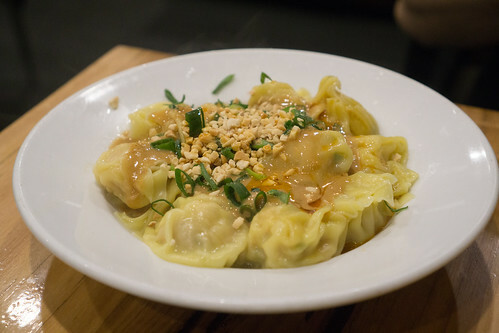 What I liked about Som Tam, is that it isn’t afraid to serve something different. 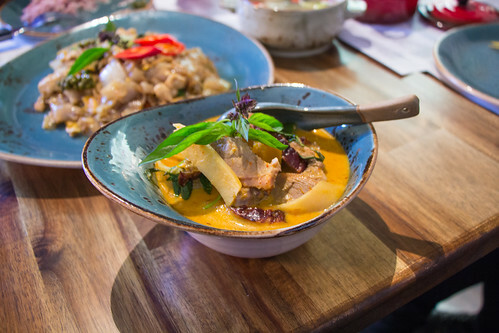 The Thai restaurants I’ve frequented tend to serve the more commonly known dishes to Melburnians, but here it not only serves these but adds something a bit different to make it their own. We dined here on a Saturday evening, and every diner receives a complimentary Thai salad. The salad is refreshing and light, with the slight sourness of the dressing and the crunchiness of the julienne vegetables. It’s quite a nice way to start your evenings meal. Satays are such a joyous thing to have as a starter. 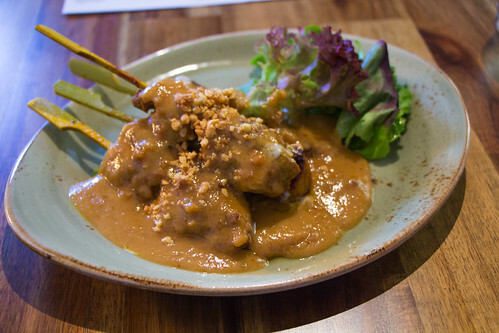 The Moo Satay here uses marinated collar pork so there is a bit of a bite to it, and served with a generous amount of their Thai peanut sauce. There is a richness to the sauce which probably comes from the use of coconut cream, and the subtlety of the turmeric and lemongrass just gives it a well rounded flavour. The nuttiness of the sauce isn’t too overpowering but it definitely goes well with the tender pork. The Vegetarian Tom Yum Soup here is in contrast to what you may typically find in other restaurants. 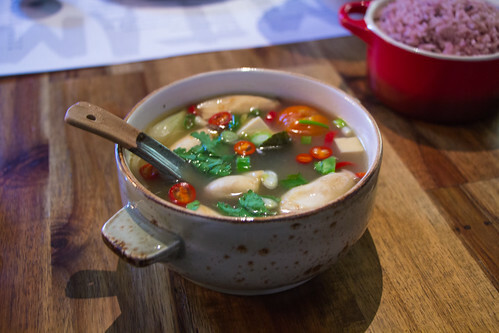 The broth is clear isn’t your typical Tom Yum, with its clear broth but what it does retain is its spiciness. 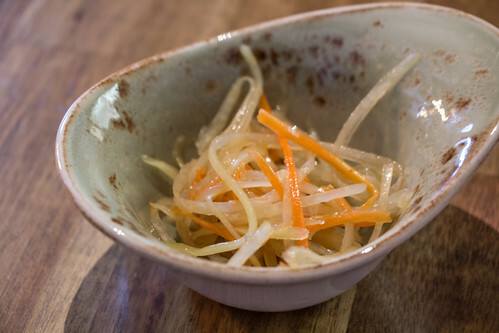 There’s also something with the combination of ingredients that I couldn’t quite work out why its different in taste but there is a slight tartness instead of the usual sweet, sour and spicy which we placed it down on the more generous use of fish sauce but I’m not certain. It may be a surprise for some, especially on taste but there is a particular cleansing nature to the soup that some may like. 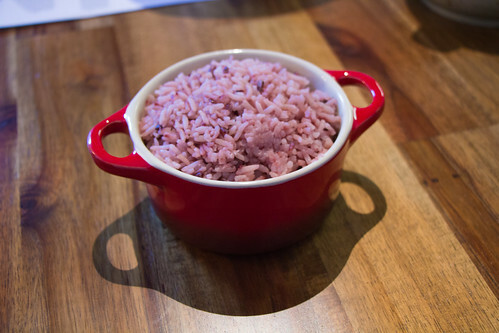 Som Tam’s Jasberry Rice is what I liken to a combination of Jasmine rice with the Black Sticky rice, which reveals itself in this purplish hue. 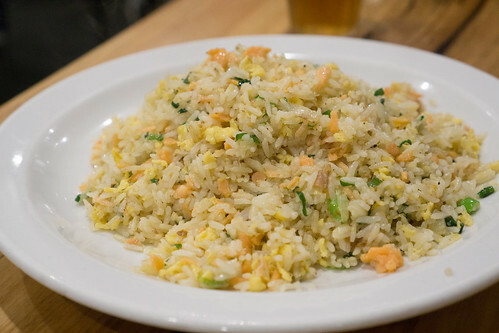 It’s an interesting type of rice and the slight bite of some of the rice grains makes it interesting, maybe similar to having Jasmine rice with brown rice actually. The Red Curry Roast Duck was probably my favourite dish of the night. According to the menu, they use an in-house five spice mix for the duck and it’s served in a red curry with longan and fresh berries. There is indeed a certain sweetness to the curry, but the combination of the spiciness and creaminess of the curry along with the spices used makes for an amazing curry. 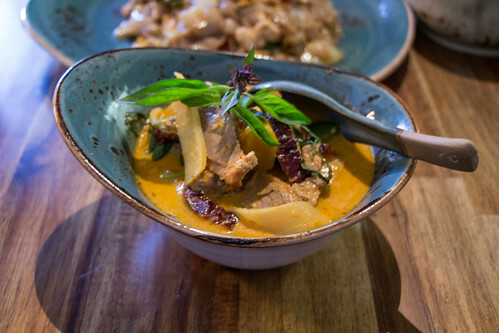 The tender duck really just adds to the depth of flavour and I could really have that red curry all to myself. The Pad Ke Mao here is another winner, what makes this fantastic is how we call it the “wok flavour” where its this high flame from the stove that somehow creates this amazing flavour that you can’t get in your standard stove at home. For those that haven’t come across this dish before, it’s a flat rice noodles with basil and chilli and the essential Thai ingredients that brings it all together. It isn’t too spicy though if you’re asking, but just enough as a little kicker. Roti’s are the crepes of South East Asia, you can have it savoury with a simple curry or add only with butter or Kaya (coconut spread) even. If you wanted it as a dessert, ice cream and fruits are commonly used. 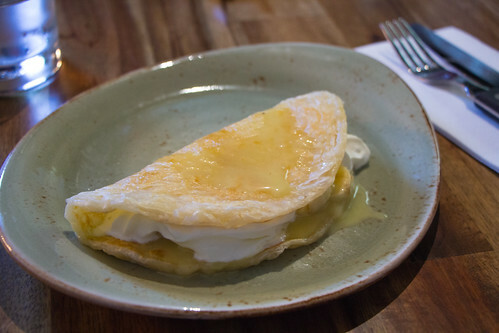 Som Tam’s Roti adds bananas with a Palm sugar syrup and whipped cream inside the roti. The roti is soft inside yet crispy and it goes exceptionally well with the bananas and syrup. You can also request to add a scoop of ice cream which I feel would be perfect together. 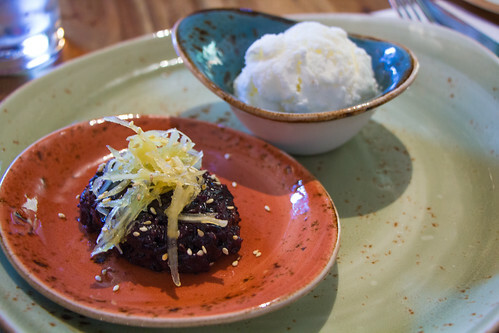 Their Black Sticky Rice with Coconut ice cream is another delicious dessert on their menu. The Black sticky rice here is different to the one served above, as they tend to add coconut milk (or cream) and sugar to make this dessert and a variation of this is also found in Malaysian cuisine. 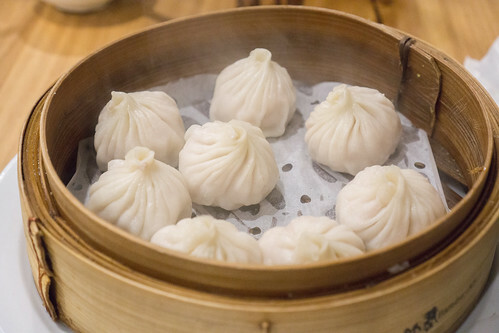 It’s served warm and as the black sticky rice retains some of its harder shell, it gives it a nice bite. Having this with a ice cream is definitely the way to go. The ice cream here isn’t as smooth or creamy as I would have liked but the coconut flavour is pleasant and it doesn’t taste artificial which is always a good thing. Som Tam really makes a name for itself here with its aromatic, and tasty Thai dishes. I had a hard time even choosing what to order because there were dishes that looked interesting such as their Green Curry Fried Rice or the Son In Law starter. The appeal of it all here is that the food is still authentically Thai and yet something distinctively modern and fresh about it. I’d also like to add the service here was fantastic, they were attentive and friendly and made you feel at ease. So overall, it was a wonderful night out, great good with great people to enjoy it with.